Established in 2001, ARHEN is the peak body which connects 11 University Departments of Rural Health (UDRHs) in rural and remote areas in every state and the NT in Australia. The Eye & Vision Care Toolkit is a comprehensive package of resources designed to support stronger eye care systems for Aboriginal and Torres Strait Islander communities. Importantly, this Toolkit was developed, tried and tested by working closely with a number of Aboriginal Community Controlled Health Services. It is designed to guide and equip primary health care services, and the eye care practitioners or organisations they partner with, to provide timely and effective eye care for their patients. HETI works closely with local health networks and other public health organisations and clinical training providers to develop and deliver clinical education and training across the NSW public health system. This online Aboriginal Cultural Orientation package is designed for health professionals, health science students and people working in various health care settings. It aims to help you deepen your understanding of Aboriginal cultural values, beliefs and practices and subsequently enhance your delivery of culturally appropriate health services. Medicare offers a range of online education resources for you and your practice staff to expand and refresh your knowledge about claiming under Medicare and prescribing under the PBS. Available 24/7, Medicare online education services are a convenient option for you and your practice staff to stay informed at a time that’s convenient for you. You can locate the online services at: humanservices.gov.au/healthprofessionals then Allied Health Professionals. This campaign lead by the NSWRDN aims to support rural health professionals and encourage their own self-care during times of drought. The site (www.ruralhealthtogether.info) brings together resources to support health professionals. NEHTA has information for healthcare providers on their website. Ultrasound Training Solutions offers a range of courses that cater to a number of specialist applications. On completion of the enrolment process you will be able to view and download course material and recommended pre-reading. In 2013 the WACHS Allied Health Clinical Education Program undertook the development of an inter-profession eLearning Package with funding made available by Health Workforce Australia. The online package is free training, covering everything from planning, commencing, carrying and evaluating student placements. Designed for rural and remote allied health and nursing professionals and appropriate for both experienced supervisors and those new to supervision, the course can be completed singularly or together as a whole course. 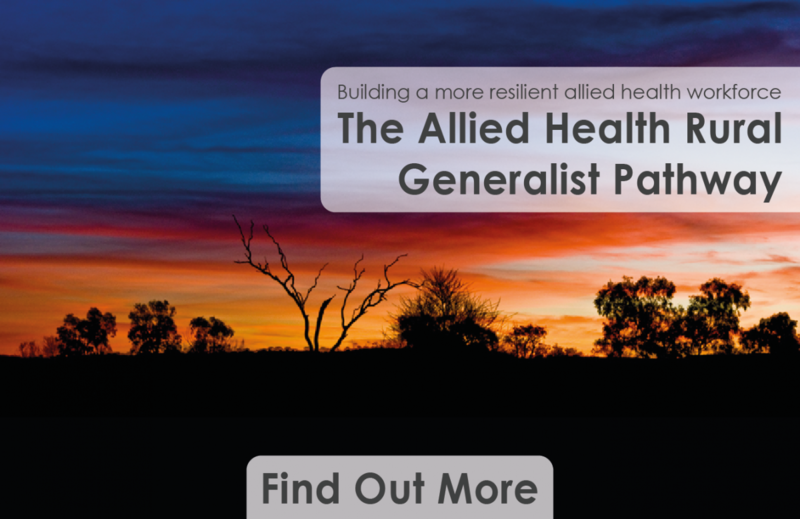 If you are a staff member of the WA Country Health Service access this package from the WACHS intranet.